Please see our 2300 DAY PROPHECY OF DANIEL which complements this study. In 2 Thessalonians 2, the apostle Paul speaks of the rise of a "man of sin" who would sit in the "temple of God" showing himself to be like God, and exalting himself into the place of Christ Jesus on earth. This man of sin was already revealed hundreds of years ago during the great Protestant reformation. But because of blindness to the truth and the deceptions of Satan, the mainstream Christian churches have all pretty much rejected the great truths that God revealed during the reformation. So here, we reveal them again for those who have eyes to see. Now what does it mean to sit in the temple of God, showing himself to be like God? Well, we know from Hebrews 8:4-5 and Hebrews 9:24 that the earthly temple (tabernacle), which God instructed Moses to make in the Old Testament was a COPY of the original temple in heaven where Jehovah resides. So let's find out from the temple sanctuary that Moses made what God's throne is like. This is the description of the articles in the most holy place of the sanctuary. We have the mercy seat, which represents the throne of God. And either side of God's throne are two golden cherubim. And remember, this is a COPY of the actual throne of God in heaven. So in heaven, God has two living cherubim either side of His throne. And Ezekiel 28:12-17 confirms that Lucifer (Satan) used to be one of those "covering cherubs". What is the "temple" today? This simple truth is overlooked by so many today. When we look for that man of sin, we should not be looking for someone to be sitting in a rebuilt temple in Israel. No, the temple of God today, as Paul and Peter confirmed, is THE CHRISTIAN CHURCH. So the man of sin we are looking for is someone SITTING IN THE 'PROFESSED' CHRISTIAN CHURCH, showing himself that he is "like God" and exalting himself to a position where he should not be. 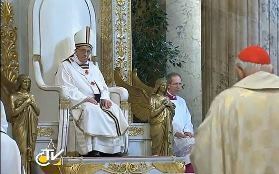 So we are looking for someone WITHIN the Professed Church, sitting on a throne, acting like he is "as God"
Above are pictures of the last two Roman Catholic Popes, Francis and Benedict, sitting on a "great white throne", BETWEEN TWO GOLDEN CHERUBIM, being called HOLY FATHER, which is reserved for God alone, putting themselves in place of God on earth and exalting themselves to a position where they should never be. "The leader of the Catholic church is defined by the faith as the Vicar of Jesus Christ (and is accepted as such by believers). 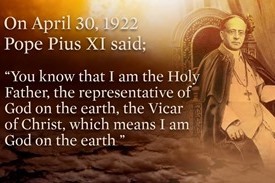 The Pope is considered the man on earth who TAKES THE PLACE of the Second Person of the omnipotent God of the Trinity." (John Paul II, Crossing the Threshold of Hope, p. 3, 1994). NO ONE can take the place of our Blessed Saviour, no one! But the man of sin 'tries' to take His place! POPE FRANCIS OFFERS 'ABSOLUTION OF SIN' FOR WOMEN WHO ABORT - Absolution of sin is something that God alone can do. But the pope tries to take the place of God on earth! So many people are looking in the wrong place for antichrist. We need to look in the professed Christian church. We need to be looking at a religious system that has put itself IN PLACE OF Christ on earth. This is antichrist. Now what else does Paul say about this man of sin? He calls him the "son of perdition". Did you know there is only one other person in the Bible with that name? JUDAS! (John 17:12). Yes, that DECEIVER FROM WITHIN THE CHURCH! God is letting us know that the man of sin would be just like Judas. Someone who is counted as "one of us", but works for Satan. For more pompous and blasphemous quotes from the Roman Church, see this page. Jesus Christ told us to call no man on earth our "Father" (Spiritual Father) for we have only ONE Father who is in heaven (Matthew 23:9). The Papacy says, call the Pope HOLY FATHER! Jesus Christ says that salvation is ONLY found through Himself (Acts 4:12). The Papacy says that salvation is ONLY found through the Roman Catholic Church! Jesus Christ told us through Jeremiah not to make offerings to or worship the "Queen of Heaven". The Papacy ENCOURAGES it's followers to make prayers, offerings and worship to the Queen of Heaven (The Roman Catholic Mary). 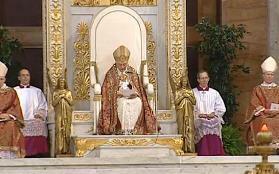 The Roman Catholic Church is so clearly an apostate church. Friends, the Bible reveals the clear truth about who the antichrist is. All of the Protestant reformers knew the truth about the man of sin and the Bible antichrist. Yes, this is an unpopular teaching, but it's the TRUTH. And if we decide to turn away from truth just because it will make us unpopular, then we are in effect turning away from Christ Jesus. See THIS SHOCKING LIST of Vatican crimes against children! Satan is setting up a major deception for the last days, and he is using the Vatican and the Roman Catholic Church to implement it. Please seek the truth and live by it. We are living in perilous times.